Geography and size: Riverside is broken down into two main areas, Riverside north-of-East Putnam Avenue and Riverside south-of- East Putnam Avenue. Parks/playgrounds/marinas/beaches: Riverside does not have any park areas but does offer playgrounds and ball fields at Riverside Elementary and Eastern Middle Schools. 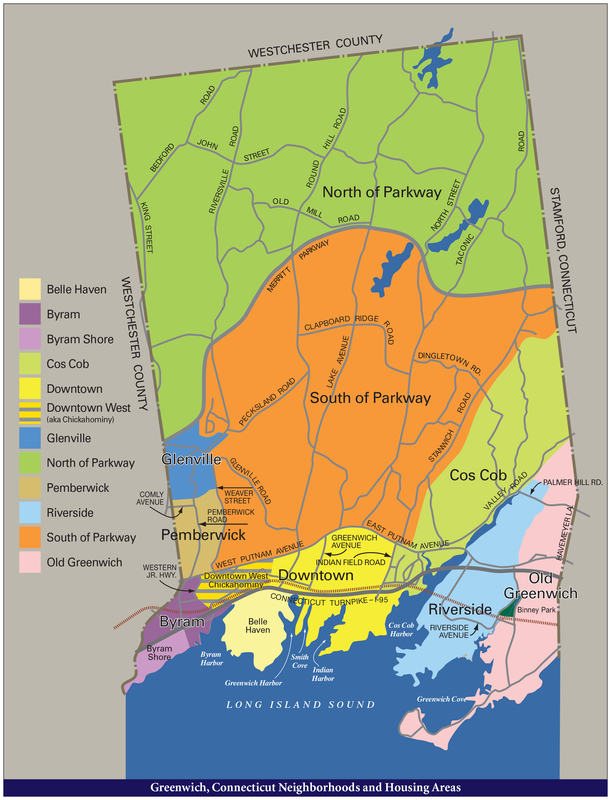 There are no public marinas or community beaches directly in Riverside but Old Greenwich's Greenwich Point (Tod's Point) is located within a 10 minutes drive from most areas of Riverside. Recreational membership clubs with facilities: Riverside features one membership club in its locale, the Riverside Yacht Club, located south of East Putnam Avenue on Club Road. Shopping and restaurants: The main shopping area in Riverside is the Riverside Shopping Center. This center features nearly a dozen store fronts with, including two restaurants. The only supermarket here is the Food Emporium. Ada's General Store, a longtime Riverside tradition, is found on Riverside Avenue selling simple products and treats. Transportation: Riverside has the Riverside Train Station at Carrona and Oval Avenues is minutes south of East Putnam Avenue. The major roadways in Riverside include East Putnam Avenue (Route #1) and Interstate 95. There are bus runs through Riverside on East Putnam Avenue with the closest scheduled stop at either East Putnam Avenue and Sound Beach Avenue (Old Greenwich) or in the Cos Cob area at East Putnam Avenue and Orchard Street. Travel time to mid-town Manhattan, no matter the mode of transportation, is between 35 minutes to 55 minutes. Neighboring Stamford is no more than fifteen minutes away. Have a question about buying a home in Riverside or Greenwich? Contact Edward Mortimer!